The Estates General convened as scheduled in May 1789 at Versailles, where the king and his court were established, twelve miles from Paris. Representing the Catholic Church were many ordinary parish priests. The nobles had selected their representatives, many of them the kind of impoverished hereditary nobles not usually seen at court – men who wore their elaborate garb while marching at the head of the procession in the opening ceremony. Less than half of the 1,200 delegates were middle-class lawyers representing their fellow commoners – the Third Estate. Delegates of the Third Estate complained that they represented 97 percent of the nation's population and should have more influence. They rebelled, breaking away and creating their own convention, which they called the "National Assembly." It was a challenge to the other two orders and to the authority of the king. Liberal-minded clergy and nobility left the Estates General and joined the National Assembly. Amid cheering at the National Assembly, nobles announced their willingness to give up their feudal rights. Members of the National Assembly called for the creation of a parliamentary system similar to what the British had, and they swore not to disperse until a constitution had been written and ratified – to be known as the Tennis Court Oath. 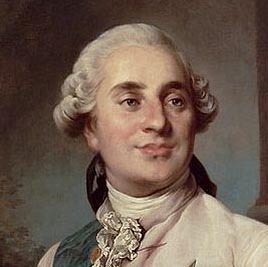 Louis XVI was gentle by nature, but he mobilized his troops against the National Assembly and its supporters. Then he vacillated, allowing the creation of the National Assembly. Louis XVI was surrendering some of the power that for two hundred years had been thought of as absolute. In Paris, people had been blaming the old order, hoarders and greedy merchants or the rich in general for their troubles. The people of Paris welcomed news of the National Assembly's creation, and they saw evil at work in the dismissal of the king's finance minister, Jacques Necker. People in Paris marched in the streets. Cavalry tried to disperse the demonstrators. Demonstrators threw stones and debris at the cavalry, and rumors spread that more troops were about to attack the city. Barricades were erected in the streets with the call for people to arm themselves. Crowds emptied gunshops. Soldiers joined the crowds and joined in the looting. On July 14, to obtain gunpowder and more guns, a crowd of around 80,000 stormed an old fort in the city, the Bastille, and demanded surrender of the fortress. Those storming the Bastille killed a few of the 30 or so garrison soldiers defending it, and the attackers suffered 98 killed and 78 wounded. The crowd released the seven who had been prisoners in the Bastille. 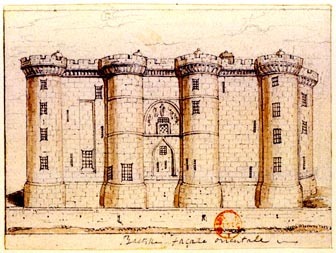 The Bastille, a fortress-prison 400 years old in 1789. The Bastille had been a symbol of authority, and people in Paris saw themselves as having taken control of the city. The municipal authorities that King Louis had appointed were replaced by sympathizers. And the king's troops were replaced by a militia of armed people called the National Guard. The king, eager to maintain what he thought was his good standing with his subjects, gave in and endorsed the new order in Paris. People were also rebelling outside of Paris. Most of France was rural: 80 percent of the population living in villages or hamlets of less than 2,000 people. Those who tilled the soil had not been suffering as much from hunger as people in the cities, but peasants had been unhappy with taxes, dues payments and other obligations to nobles, such as labor drafts to work on roads. Peasants were unhappy about the rise in rents in recent years (a rise due in part to an increase in population). In the countryside were also those too poor for tenant farming. There were people who had been surviving by home industry or labor at harvest time, people who had been living off public and private charity, stealing bread or pennies from charity boxes, and many of them were ready for revolution. With rebellion in the countryside, peasants with property to protect were afraid of roving bands of vagrants. Rumors spread that the nobility was paying brigands to march against them. The rumored armies never materialized, but where life was hardest the peasants attacked more successful peasants, and they attacked the grand manor houses and castles of nobles, burned title deeds and searched for hoarded grain. Peasants believed that the days of paying taxes to nobles were over, and some tried to retrieve taxes they had recently paid in the form of grain. Nobles who resisted were sometimes killed. If the peasants could not find title deeds, they sometimes burned down the noble's home. In towns, tax offices were attacked. Soldiers threw down their weapons, and about half of the municipalities experiencing risings came under new leadership that associated itself with the authority of the people's National Assembly, while wielding what power and influence they could. In other municipalities, revolutionary committees shared power with the town councils. And in some places, townsmen were appalled by attacks on nobles, and they did what they could to maintain order, including hanging those they considered brigands. Delegates to the National Assembly were alarmed by the spreading violence. They responded with speeches about lifting the yoke that for centuries had weighed upon the peasants. On August 4, the National Assembly made the abolition of feudal privileges official. Nobles were prohibited from charging dues, from making people work on roads or from holding exclusive hunting rights. The National Assembly removed nobles as makers of law in what had been their areas of rule. Their courts were abolished. They were no longer exempt from paying taxes. And the National Assembly ended obligations to pay tithes to the Church. On August 27, the National Assembly issued its Declaration of the Rights of Man and Citizen, the draft of which had been discussed with Thomas Jefferson, then U.S. ambassador to France. Rather than law, this was a statement of principles (drawn in part from the American Declaration of Independence) the purpose of which was to educate and enhance love of liberty. The declaration spoke of man's natural right to liberty and right to resist oppression. It spoke of a right to property. Virtue and talent, it stated, should be the only requirements for public office. It claimed that all "men" should be equal before the law, that arbitrary arrests should be illegal, that people should be presumed innocent until proven otherwise in a court of law, and that there should be freedom of opinion concerning religion. The National Assembly had declared itself sovereign but was seeking the king's cooperation. Louis announced that he agreed with the "spirit" of the constitution. But when he expressed his own ideas about specific points, newspapers supporting revolution interpreted the king's opinions as hostile opposition to the constitution, and they spread animosity toward the king. Deputies to the National Convention and the many who supported the revolution looked upon Louis with greater suspicion.